UK’s support for Bahrain’s sham-elections emboldens the Gulf nation to continue intensifying its crackdown on civil rights with impunity. 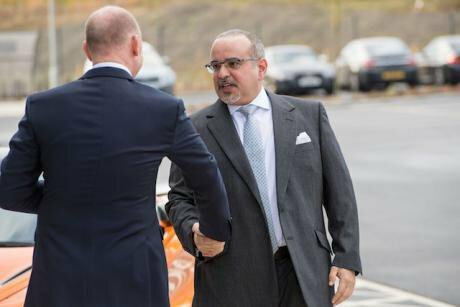 Prince Salman bin Hamad bin Isa Al Khalifa, Deputy King, Crown Prince of Bahrain at the official opening of the new Composites Technology Center at McLaren Automotive in Rotherham, South Yorkshire, UK. Picture by DPPA/Sipa USA/PA images. All rights reserved. The promising news of British academic Matthew Hedges’ release from detention in the UAE following a presidential pardon came only four days after he was handed a life sentence for arbitrary charges relating to espionage. The Foreign and Commonwealth Office (FCO) demonstrated a swift and compassionate response to the PhD student’s plight and should be applauded for their efforts to reverse the unjust conviction. Earlier this month, opposition leader Sheikh Ali Salman also received a life sentence from another UK Gulf ally, Bahrain, for similarly bogus charges relating to espionage. Unfortunately for the prominent Bahraini political figure, a pardon was never in consideration. The difference in approach is startling. The FCO’s commitment to the promotion and protection of human rights is evidently contingent upon their strategic interests and political will. To western leaders, the need for allies to buy their weapons is infinitely more important than holding their allies accountable for crushing civil society at home or starving children to death in Yemen, among other ongoing human rights abuses. As long as the money is flowing, these abuses are not their problem. Last weekend, elections were held in Bahrain for the Council of Representatives of Bahrain’s National Assembly, wherein 40 members were elected. These members hold legislative power and are similar to the UK’s House of Commons. The crucial difference is that, in Bahrain, those elected cannot be members of the opposition. FCO Minister Alistair Burt praised the UK’s historical friendship with Bahrain’s Al Khalifa ruling family last month and has now welcomed the “continuing progress and commitment to the democratic process”, apparently demonstrated by the elections in Bahrain this past weekend. The factual basis for this support is negligible. Members of international legislative bodies condemned the elections and questioned their legitimacy, including members of the British Parliament, US Congress, EU Parliament, and Italian and Irish Parliament. In fact, even the FCO itself cannot deny knowledge of the situation in Bahrain, as it has previously highlighted some of the core issues surrounding freedom of political participation in the kingdom. Prior to the elections, the two largest political opposition societies, Al Wefaq and Wa’ad, were forcibly dissolved by the Bahraini government, and the government amped up restrictions on free expression. Bahrain’s most prominent human rights activists, Nabeel Rajab, is currently serving a seven year prison sentence for televised interviews and tweeting his condemnation of the war in Yemen and Bahrain’s participation in the atrocity. The Bahraini government took additional measures to restrict participation ahead of the elections. In May this year, legislation was amended to bar anyone who has ever belonged to one of the dissolved political societies from seeking elected office, as well as anyone who has served six months or more in prison. In a country with over 4,000 political prisoners, this severely limits those who can run for office. The human rights situation on the ground in Bahrain is similarly grim. I myself have three family members languishing in Bahraini prisons - serving lengthy sentences in reprisal for my human rights work. Among them is my mother-in-law, Hajer Mansoor, who was assaulted last September by prison guards. After repeated encouragement by UK ministers, I complained to Bahrain’s oversight bodies - bodies known for lacking independence and failing to fulfill their mandates. Despite simply proving their ineffectiveness by whitewashing the abuses, a Minister outrageously endorsed the investigations conducted by the bodies, describing them as “swift and thorough”. Unlike Hedges’ case, the FCO has taken the assurances provided by the Bahraini authorities with a ‘no questions asked’ mentality; they have never acknowledged that my family members have been targeted on account of my work and that Bahrain is culpable for the horrific human rights abuses orchestrated by its government. Bahrain is able to continue operating in the shadows, shielded by powerful western countries like the UK. The FCO is in a position to effect real change in the Gulf. Hedges’ release illustrates the capabilities of the UK government when they choose to exert their influence. If only they wielded the full extent of their authority and leverage, the FCO would be able to significantly improve the fortune of political dissidents and human rights figures in Bahrain. Instead, the UK maintains its unconditional support for the repressive regime, supplemented by a healthy £5 million in technical assistance programmes. Actions may speak louder than words, but in this case, the rhetoric of the UK is as detrimental as its money. Minister Burt’s support for these sham-elections embolden the Gulf nation to continue intensifying its crackdown on civil rights with impunity. In a repressive dictatorship, there are no meaningful elections. The purpose of having a supposed democracy is to secure the continued public praise from authoritative figures in the West. And it looks as if they are playing right into Bahrain’s bloody hands.